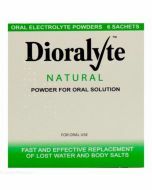 Dioralyte (natural) conatins 20 sachets of powder for oral solution. Fast and effective replacement of lost water and body salts. 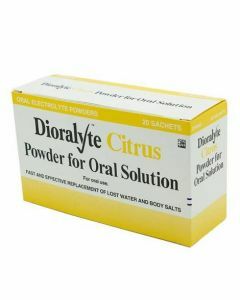 Dioralyte can be used when diarrohea and vomiting present. What is Dioralyte used for? 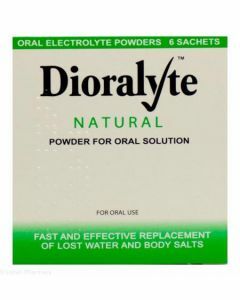 Dioralyte Natural powder for oral solution. Fast and effective replacement of lost water and body salts. sodium chloride 0.47g, potassium chloride 0.30g, glucose 3.56g, disodium hydrogen citrate 0.53g. Other ingredients include colloidal anhydrous silica, saccharin sodium. Dissolve contents of one Dioralyte sachet in 200ml (approximately 7 fluid ounces) of drinking water. Use fresh drinking water for adults and children. For infants and where drinking water is not available, the water should be freshly boiled then cooled. The solution should be made immediately before use. If refrigerated the solution may be stored for up to 24 hours, otherwise any solution remaining one hour after reconstitution should be discarded. The solution must not be boiled after reconstitution. Dose: Unless prescribed otherwise by your doctor. Adults (including elderly): (20-40 ml/kg) One or two sachets after every loose motion (each sachet dissolved in 200ml of water). More may be required initially to ensure early and full repletion. Children: (20-40 ml/kg) One sachet after every loose motion. Infants under 1 year: Should only be used on medical advice. Infants aged 1-2 years: (150 ml/kg) One to one and a half times the usual feed volume. If the illness is not improving within 24-36 hours consult your doctor. When vomiting is present with the diarrhoea, it is recommended that small amounts be taken frequently. 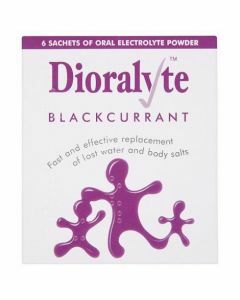 Dioralyte should be reconstituted with water and to the volume stated. 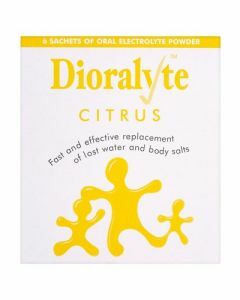 A lesser or greater dilution may result in electrolyte imbalance.